I feel like a tourist visiting my own youth. I’m at the Roundhouse in Camden to see My Bloody Valentines comeback performances and I’m surrounded by various versions of what I could have become: balder, hairier, thinner, richer, or those that refused to grow up. And we’re all on edge, about to relive part of our collective youths. It’s 16 years since MBVs last tour and despite their silence and relatively brief catalogue, MBV still occupy a legendary corner of shoegazing indie music that’s all their own. Theirs was a strange bleached out, blurred, soft focus guitar-drone music – stuff that actually didn’t really sound like music at all. And though they seemed to be embedded in a particular trajectory of rock, they produced a kind of anti-rock. To an undergraduate student it sounded like the most important thing to happen to architecture in the 1980s: where sound formed space and sensation beyond the limits of a Rotering pen and a balsa wood model. MBV took traditional elements of a pop song: verse, chorus, bridge and fused them into a lump of sonic experience. It’s a sound that you feel in your stomach rather than hear with your ears. They were not songs that had any kind of narrative, they were descriptions of abstract sensations: things slipping away, fading, merging in bending detuned chords. They were about things that you might feel or imagine, but which could never really exist. This strange kind of physicality is the subtext of titles like “I Can See It, But I Can’t Feel It” or the oddly cloying “Soft as snow, but warm inside” both tracks on their first album, “Isn’t Anything” (Itself a phrase which suggests an order of difference to the normal physics of form and material). How could so much sound add up to nothing? Why would you approach the idea of nothing and vanishing through so much presence? 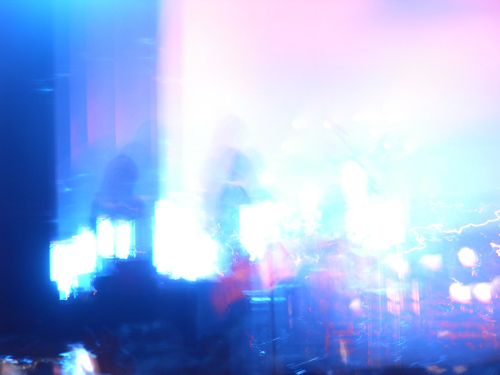 MBV seemed to invert the normal order of things. And at the same time seemed to allow their music to connect to other traditions and trajectories. ‘All that is solid melts into air, all that is holy is profaned, and man is at last compelled to face with sober senses, his real conditions of life, and his relations with his kind.’ wrote Marx on the abstracting power of capitalism the Communist Manifesto, but he might as well have been writing a manifesto for MBV. Equally, when Mies van der Rohe said “Less is more”, he might have been reviewing Loveless for Melody Maker. These concepts seemed to resonate through My Bloody Valentine. The blurry, bleached out album covers seemed to be snapshots of the material world becoming vapour. The visual and aural aesthetic somehow seemed to expresses Modernitys mysterious longing to disappear. MBVs music smears tune like blurred photography: foreground merges with background, light with dark, noise with silence. Like a Miesian corner – where the apex is set back – the feeling of nothingness is created by tremendous amount of stuff held back from the traditional point of resolution, as though absence could only be evoked through the presence of such concentrated mass. MBVs live shows build up to a particular moment of sonic intensity, nicknamed ‘The Holocaust’. It’s a 20-ish minute aural assault sandwiched in the middle of ‘You Made Me Realise’. The Holocaust is a relentless repeating chord at massive volume. It’s so loud that the sound becomes a physical force: clothes start to flap as though in wind, our internal organs start to vibrate. And in this rush of sound you start to hallucinate aural mirages – ringings that seems to sparkle though the mix. It’s as though you are standing in the blasting burnout of late industrialisation – a relentless rumble of which dissolves into a kind of tingling ecstasy. It feels as though sound is forming into some kind of substance – something that might have a place on the periodic table somewhere near Californium (colour unknown, but probably metallic and silvery white or grey in appearance) or Darmstadtium (a synthetic element that is not present in the environment at all) – those elements which only exist fleetingly under the most exacting of conditions before collapsing under their own impossibility. MBVs Holocaust is an ultimate conclusion of a particular strand of thinking about music. It’s a beautiful and horrifying dead end, a kind of singularity that expands into vast horizons. Through repetitive single-mindedness, sheer volume and length it reaches into a kind of cosmic sci-fi. And it’s this that we’ve all come to the Roundhouse to experience. 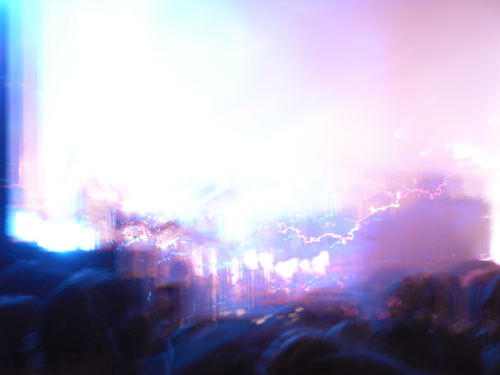 The audience is held in this cloud of massive volume, earplugs in, quietly vibrating until they can’t bear any more. Some are wheeled out in St Johns Ambulance wheelchairs, collapsing in the face of sustained horrific reverie. Through sound, MBV create a kind of spatial and physical construct – not architecture as frozen music but fluid, blurry volume as architecture. It’s an architecture that isn’t anything more than a physical sensation, but one that’s so close to substance it might just start to congeal in the air like the particles suspended in a rapid prototyping tank. It’s no wonder that the music journalism cliche of the shoegazing era described these textures and layers as “sonic cathedrals” – pieces of architecture that you could hear but not see. And in the midst of this dense cloud of MBVs frantically oscillating waveforms, it feels like the most profound architectural experience – the first gig to be awarded the Stirling Prize.